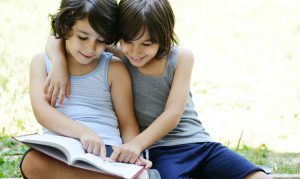 Reading for pleasure during childhood has a substantial influence on a person’s vocabulary 30 years later. Researchers at the Institute of Education (IOE) have reached this conclusion after studying the vocabulary test scores of more than 9,400 British people at the ages of 10, 16 and 42. Their statistical analysis showed that those who had regularly read for pleasure at 10 scored 67 per cent in the age 42 vocabulary test, whereas infrequent childhood readers scored only 51 per cent. The IOE study also confirmed that what people chose to read as adults mattered as much as how often they read – in terms of the effect on vocabulary scores at 42.The greatest improvements between ages 16 and 42 were made by readers of ‘highbrow’ fiction. The researchers found — again after taking into account social backgrounds and vocabulary scores in childhood — that those who read such novels scored 5 percentage points higher in the age 42 test than people who did not read literary fiction as adults. The vocabulary gains linked to reading factual books were smaller than those for fiction. The vocabulary scores of the two groups of graduates were quite different too – at both 16 and 42. Russell Group graduates scored 70 per cent at age 16 and 81 per cent at age 42. The scores of graduates of other universities were lower at both ages (63% at 16 and 73% at 42). The new research builds on previous work that Sullivan and Brown have done which showed that reading for pleasure was linked to intellectual development up to age 16, especially in vocabulary but also for mathematics. “We have now shown – for the first time, we believe — that reading for pleasure, both in childhood and adulthood, has a positive impact on the vocabulary of people in their early forties,” Professor Sullivan said.